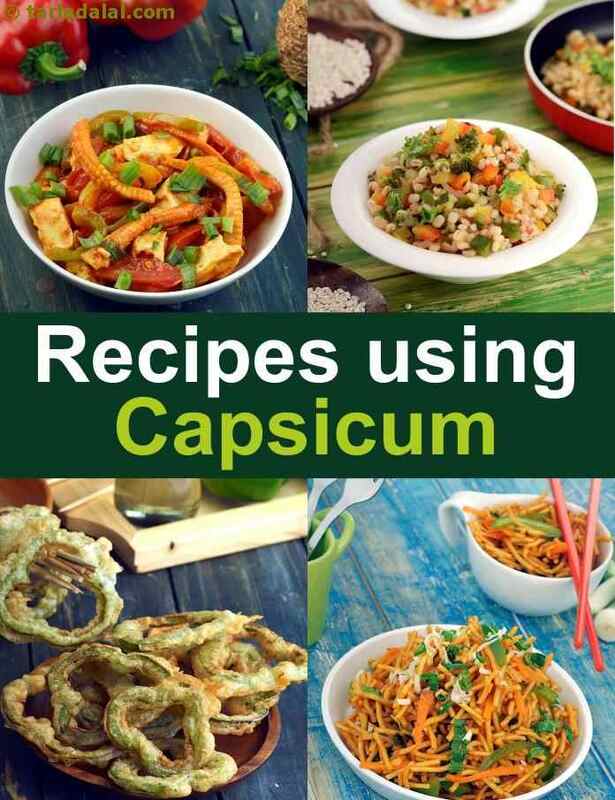 capsicum recipes collection. indian capsicum recipes. Capsicum, popularly known as Shimla Mirch is also known as Bell pepper or sweet pepper. You can find different varieties of it viz. green, yellow and red. The sweet taste and crunchy texture makes capsicum a versatile ingredient and is generally accompanied with other vegetables in various dishes. Bell peppers are not only eye appealing but, also have numerous health benefits. Read them here! Capsicum can be eaten raw in salads, marinated to make satays, tossed into pasta, topped on a pizza or simply cooked and sieved to transform into a pepper sauce. Pair with any vegetable to create delectable soups like Sweet Corn and Capsicum Soup, Noodle, Sprouts & Capsicum Soup or a Broccoli and Red Capsicum Soup that do not require a big list of ingredients and can be made quickly. Capsicum is also widely used in oriental cuisine by tossing along with spring onions, ginger, green chillies and sauces to make a wide range of starters and stir-fries like Spicy Stir Fry Noodles in Schezuan Sauce, Chinese Bhel, Crispy Fried Vegetables with Burnt Garlic. When mixed together with veggies like onion, corn and paneer, capsicum makes a vibrant and filling stuffing for sandwiches and rolls. Also, you can add slices of capsicum to make delectable grilled sandwiches. In fact, you can roast a capsicum and grind it along with cheese to make a quick Roasted Red Capsicum and Cheese Tava Sandwich. You can even make lip-smacking appetizers like the Capsicum and corn rolls that are crispy on the outside and soft, gooey on the inside making it an irresistible snack. Because of the hollow shape, sweet peppers are perfect for stuffing. From a healthy Stuffed capsicum with Curds, Cucumber and Penne Salad to a creamy risotto filled Baked Stuffed Capsicum, try your hands on these delicious stuffed capsicum recipes. Also, you can make Stuffed Capsicum in Tomato Gravy low-fat dairy products that is diabetic-friendly. Capsicum can be used to make Indian foods ranging from accompaniments like chutney, pickle to main course delights like pulao, subzi, etc. Capsicum Dishes like Tava Paneer, Mushroom and Green Pea Subzi or Coloured Capsicum and Paneer Subzi and rice preparations like Baby Corn and Capsicum Rice are not only colorful but also, flavorful. Also, the combination of paneer and capsicum works really well. Paneer Capsicum Stir-fry, Paneer and Capsicum On Toast and Paneer and Capsicum Hot Dog Roll are some recipes you must try! Check our website to explore more capsicum recipes, or you may want to check our collection of capsicum cube recipes.